When the leaves first bud out in early spring, they’re a unique pink-red color, and eventually turn a deep green. 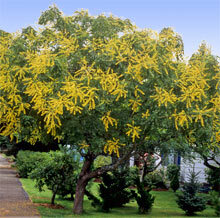 It’s one of the few trees to feature yellow flowers that erupt in a glorious cascade all over the canopy in midsummer. But don’t let their delicate appearance fool you. These versatile champions stand up to heat, harsh climates and city pollution equally well. You often see them as street trees in urban environments and as fabulous focal points in groups of three to five in landscapes. Plant them 25-30 feet apart. Currently shipping 1-2 foot bare root seedlings.